This page presents a short description of how the nature and vegetation in Denmark is related to climatological, geological and historical factors. Here is a map of Denmark. Denmark is a part of the North European Plain, which lies between the Fenno-Scandinavian mountain shield in the north and the central european mountains, including the Alps, in the south. This lowland includes the south-eastern parts of Great Britain, most of The Netherlands, Denmark, Northern Germany, Northern Poland and continues eastward through the Baltic States into Belarus and Russia. Most of the landscapes of the North Europeaen Plain have been shaped during the Quaternary era (the last 2 million years) and in particular by the last glaciation which ended approximately 10.000 years ago. A great deal of the North Europaean soils were formed as sediments in this era in connection with the many inland ice periods. Denmark is situated in the temperate zone of Europe with broadleaved mixed decidous forest as the dominant natural vegetation. The western parts of the country is under influence of humid and mild oceanic climate from the Atlantic and evergreen dwarf shrubs grow where forests cannot establish themselves for climatic or cultural reasons. The eastern parts have a more dry and continental climate. All though Denmark is a small country (app. 40.000 square km.) whithout mountains (highest hill 172 m above sea level), the vegetation is anyway quite different in the different parts of the country. First of all the soil properties are much variable with limestone deposits, loamy, clayey and more sandy soils. 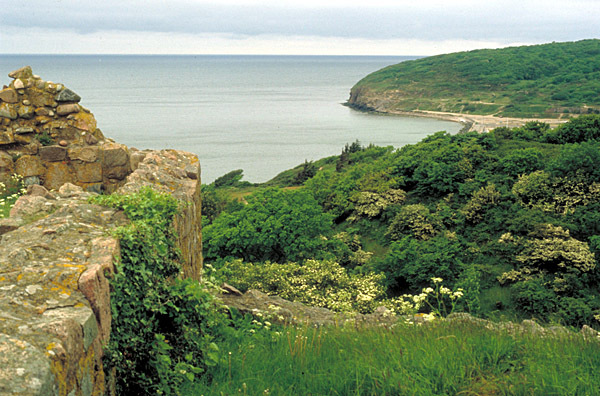 The island Bornholm at east is the only place in Denmark where solid rock lies fully exposed. 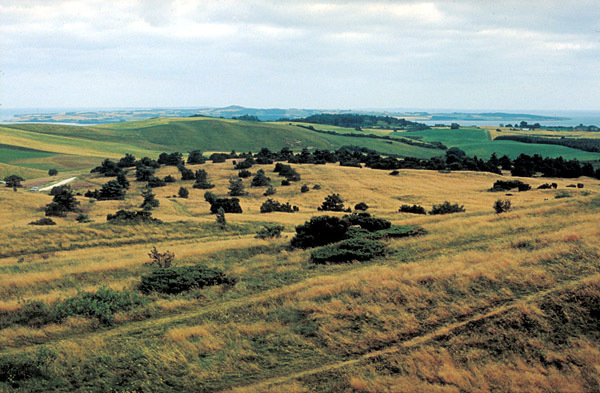 The landscapes of Denmark are modelled by the large glaciers through the last ice age. The ice covered most of the country, but the glaciers stopped for a longer time in the middle of the peninsula Jutland (Jylland). In the south western parts of Jutland the soil are sandy due to sediments from the large rivers of melting water running out from the glaciers and the landscape is rather flat. Where the glaciers stopped in the middle of Jutland the underlying soil were pressed up in the highest hills in Denmark. The result is seen today as a north-south running "mountain range" with "peaks" up to 172 m above sea level. The rest of Jutland and the danish isles are generally built up of sediments deposited through melting of the ice cap (morain). The soils are loamy or clayey and the landscape is much varied. Some places the rivers from the glaciers has deposited smaller plains of sandy sediments e.g. in Djursland (the "nose" of Jutland) and in North Western Seeland (Sjælland). The layers from the Quarternary period are generally thick, e.g. 200 m at Skagen (the northmost tip of Jutland), and older layers are completely covered. From the north-western parts of Denmark and to the south-east, the Quarternary layers are rather thin, probably due to upfolding of the older underlying layers. Through pressure from the ice age glaciers and a generally rising of the north-western parts of the country since the last ice age, the underlying layers has been lifted up and are exposed at the coasts or only slightly covered by younger layers. Particularly the limestone from the Cretaceus period has a great influence on the vegetation. 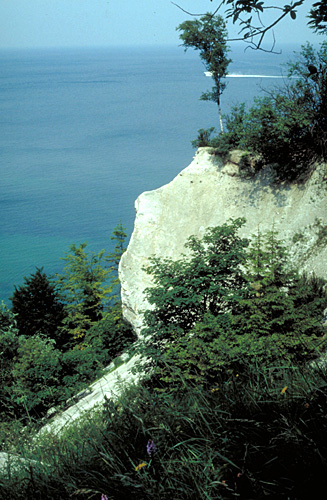 Limestone lies near the soil surface in a stretch from North Western Jutland and south-east through Djursland (e.g exposed at Sangstrup Klint) and Mid Seeland to the island of Mon (Møn). Because of the land rising most of North Jutland has risen from the sea since the last ice age and the soils are sandy except the highest plateaus where the soil are loamy or clayey. 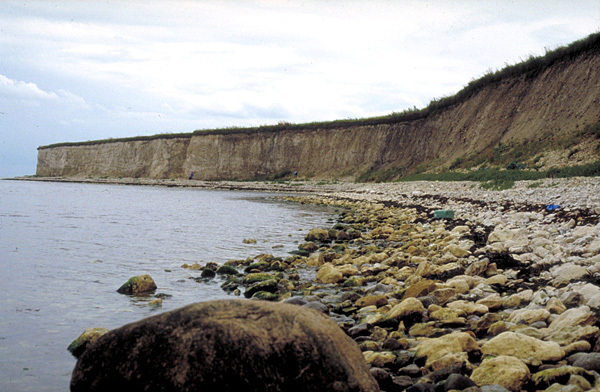 In North West Jutland the limestone from the Cretaceus can be seen in the slopes along hills (e.g at Bulbjerg). These hills were islands in an older time period when the sea level were much higher than today. The island Bornholm is lying in the border between the Fenno-Scandinavian mountain sheld and the North European Plain. 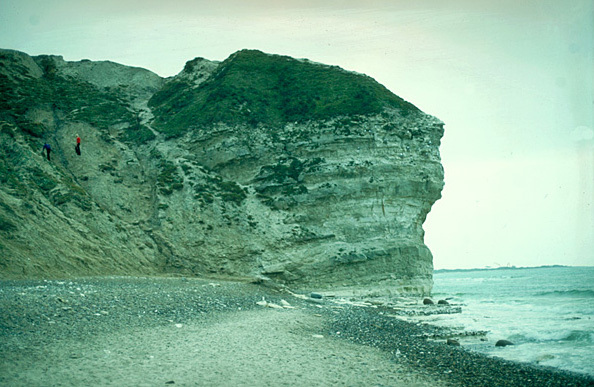 In the northern parts of the island the bed-rock lies directly below the ice age deposits and is exposed many places, especially along the coasts (e.g. at Hammeren). Layers from the Palaeozoic and Mesozoic can be seen in the southern part of Bornholm. 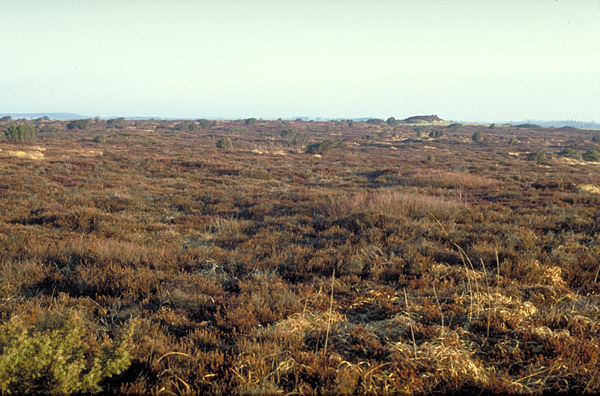 Because of the rocky ground, Bornholm has several plant species not found in other parts of Denmark. Denmark is situated in the zone between three european biogeographical provinces (the Boreal, the Atlantic and the Continental provinces) and the vegetation throughout Denmark is a mixture of these provinces. Because of the vegetation history since the last ice age, plants from other provinces can be found. Especially plants from the Pontian Steppe province are rather frequent in dry habitats. Together with the soil composition, also the climatic factors are rather variable within Denmark and has an influence on the distribution of plants. Generally the western parts of the country has atlantic climate and the eastern parts continental climate, but this picture is modified because Denmark is an archipelago. The yearly precipitation is over 900 mm in some parts of Jutland and below 500 mm over The Great Belt between Jutland and Seeland. The rain is more or less even distributed through the year, but as the evaporation is less in the cool months october to march, the winter is the most humid time of the year. Over the year the temperature is naturally highest, over 8,5 degrees C, in the southern parts of the country and below 7,5 in the northern parts of Jutland. July is the warmest month with a mean temperature over 17,5 degrees C in southeast and just below 16 in the northwest of Jutland. January is the coldest period in Denmark, but the mean temperature of c. 0 degrees C is more even throughout the country because of the warming effect from the surrunding sea. During the late glacial period (The Continental Period) for app. 15.000 to 10.000 years ago Denmark was connected to Great Britain and Sweden. The sea level was much lover than today because much of the seawater was bound in the km thick ice cover over the northern hemisphere. In this time the climate in Denmark was dry and continental but still cool. The soils were bare, open and chalky, but poor in other nutrients. Remains of several species of steppe plants or plants with a continental distribution today has been found in deposits in danish bogs from this time period. The plants must have immigrated from the southeastern parts of Europe. Some of these species are still to be found in Denmark e.g. Sea-buckthorn (Hippophaë rhamnoides), Common Rock-rose (Helianthemum nummularium) and Purple Milk-vetch (Astragalus danicus). Also plants which has their main distribution in the central europaean mountain regions are belived to have immigrated to Denmark in this period e.g. Hoary Plantain (Plantago media), Salad Burnet (Sanguisorba minor) and Dwarf Milkwort (Polygala amarella) together with several other species of open grassland plants. Later the climate became slowly warmer and the warmth culminated in the The Atlantic Period for c. 5.000 years ago. Denmark was then a archipelago because of a higher sea level due to melting of the ice caps. The whole dry land except along the coasts were covered with a primeval broadleaved forest dominated by the Small-leaved Lime (Tilia cordata). Other trees were Large-leaved Lime (Tilia platyphylla), Wych Elm (Ulmus glabra), Small-leaved Elm (U. carpinifolia), Pedunculate Oak (Quercus robur) and Ash (Fraxinus excelsior). Remains of the waterplant Trapa natans found in lake deposits in the south eastern parts of Denmark indicate the 2 to 3 degrees higher temperatures. During the end of The Atlantic Period man began clearing of the forest and cultivation of the land, and together with a decline in the temperature the forests slowly changed. At the beginning of The Subatlantic Period for about 2.500 years ago the Beech (Fagus sylvatica) became the dominant forest tree as it is today. Through grazing of domestic animals and expansion of the cultivation, the landscape became open and a lot of light-dependent plant species immigrated to the fields and grassland. Some of these plants may have followed the agriculture from south and south-eastern Europe. Today all of Denmark is more or less cultivated. Only the coasts has natural vegetation. Intensive cultivation of fields, grassland and forest leaves only a few species of plants, but in many spots the cultivation is extensive with a very rich and interesting vegetation. "Danmarks Natur". Politikens Forlag. 1975. ISBN 87-567-0459-3. "Europe's Environment". European Environment Agency. Copenhagen. 1995. ISBN 92-826-5409-5. "Guide til det danske landskab". Henrik Vejre and Thomas Wikstrøm. Rhodos, København. 1995. ISBN 87-7245-622-1.